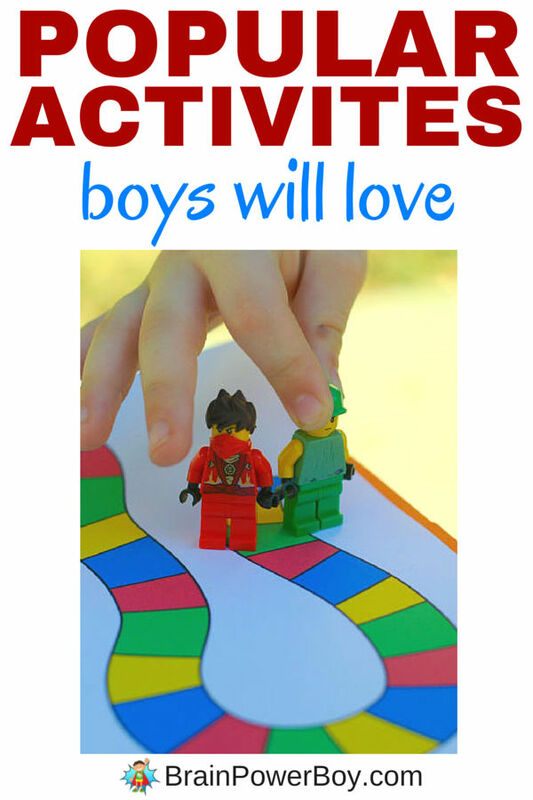 Check out these fun and popular activities for boys! They are totally going to want to do them. I sincerely enjoy finding things that help you meet your goal of raising boys who love to learn. It is so wonderful to hear comments about the activities your boys enjoyed or how an article touched you or helped you resolve an issue your boy was having. I like to see which articles really got you excited to do something new with your boys or got them excited about an activity, book or project. I do this for two reasons. The first is to make sure that I am offering you a wide variety of articles that you will all enjoy, and the second is to find out what you liked the most so I create more of it for you! Check out these popular and fun activities! Everyone around here loves LEGO and they also really love science so we rounded up a bunch of great LEGO science ideas that we knew would go over big. Try LEGO Learning: Awesome LEGO Science Projects! to see all the fun ideas. This one was a hit right off the bat: 180+ Free Printable LEGO Coloring Pages! The article is broken down by the type of LEGO coloring sheets so you can find what your boy likes quite easily. There are over 180 free printables to choose from! Print and use them in restaurants, at appointments or just at home for a bit of quiet time. If you are looking for a fun way to teach the basics of math add in a bit of LEGO. LEGO Learning: Math Games offers several math games which feature LEGO and don’t worry – I made sure they were fun too! Here are some Sight Word Games Boys Will Go For. They include just they type of thing active boys will enjoy. Some hands-on learning at its best. Includes drag racing, aliens, sharks, jumping, and crashing games to name a few. Play and Learn with Rube Goldberg Machines is full of Rube Goldberg™ goodness. Honestly, if you have not seen this article, you need to go check it out. We are huge Rube fans and just love to mess around with this type of thing. The learning that happens while playing around with Rube Goldberg™ ideas is amazing. 9 Dinosaur Activities for Toddlers and Their Big Brothers was written by my friend Clare, from Super Mommy Club (take a minute to go check her out,) and is just perfect for multi-age play opportunities featuring the perennial boy favorite . . . dinosaurs. Try this Dinosaur Fossil Dig idea. It is a post about a dino party but you can certainly use the ideas for a play date or just for a fun way to play with your boys! I am keen on free printable games so we will be creating more of these for you this year. Here are some popular Free Printable Games with Boy Appeal that we gathered together. It includes, bugs, planets, robots, monkeys, vehicles, sports and LEGO games. Yup, it is a good selection. This little robot game is one of my favorites. Play this Fun Robot Memory Game was one of the first memory games I made for our site and I really like the robot graphics – so colorful and fun. Memory games are great for learning and I hope you will enjoy this one. If your boy is into nature he might enjoy these Fairy Gardens for Boys! There are fun ideas here including dinosaur gardens, Star Wars gardens and more. When I saw a few totally awesome snowflakes like Star Wars snowflakes and Batman snowflakes, I knew I had to find more. And here they are: DIY Geek Snowflakes for Boys to Make. These are so much fun to make. These are super fun to make! Superhero Craft Ideas for Boys If you have a boy who enjoys making things with his hands and also like superheroes, this is the post for you! Unplugged Coding is very popular and fits right in with all the emphasis on coding right now. All of these ideas can be done offline! How about over 50 cool Ideas for Unplugged Play? These ought to keep them engaged and off screens! Wow! There are a lot of great activities for boys here. Take your time and go through to find the ones you think your boys will enjoy. Pin them to your boards to save them or bookmark this article so you can find them again when you need something fun to do.